NAIROBI, KENYA(AP)What happens when an American president invites his African relatives to dinner at a Nairobi hotel? A lot of family members show up — more, perhaps, than he even knew he had. The day after dining with about three dozen relatives here, Obama reflected on the time they spent together "just catching up." He said some were distant relatives he'd never met before, despite visiting Kenya twice in the past. Chuckling, he recalled the "lengthy explanations" about how one relative or another was connected to the Obama clan. "I think the people of Kenya will be familiar with the need to manage family politics sometimes in these extended families," Obama said with a knowing grin. With a hint of frustration, Obama said he had told his family how sorry he was he couldn't spend more quality time with them on this visit. Logistical and security considerations prevented Obama from visiting Kogelo, where his father lived and is buried. But Obama said once he leaves office, he'll have a better opportunity to reconnect. "The next time I'm back, I may not be wearing a suit. The first time I came here, I was in jeans and a backpack," Obama said, recalling his first trip nearly 30 years ago. He may also bring back with him a few relatives of his own. Obama said after leaving the White House, he plans to return with first lady Michelle Obama and daughters Sasha and Malia. "They have great love for this country and its people," he said. Kenyans eager to have their country in the spotlight during President Barack Obama's visit have been irked by a news report describing the East African nation as a "hotbed of terror." Kenyans quickly mobilized a Twitter campaign using the hashtag #SomeoneTellCNN to correct what many here have called an exaggeration by the television network. President Uhuru Kenyatta even joined in, telling attendees at the Global Entrepreneurship Summit that they will find Kenya to be "a hotbed of vibrant culture, spectacular natural beauty, and a wonderful people with infinite possibility." The crowd laughed and applauded at his remarks. Kenya has struggled to contain the threat from al-Shabab militants based in neighboring Somalia. Al-Shabab, a group linked to al-Qaeda, has conducted major attacks in Kenya, including the 2013 attack on Nairobi's Westgate mall and an April attack in Garissa town that killed nearly 150 people. CNN later added an editors' note to its story on its website that read: "The headline and lead of this article has been recast to indicate the terror threat is a regional one." A CNN spokeswoman said the network had no further comment. Kenyan troops are deployed in Somalia to counter al-Shabab, and the United States has carried out drone strikes against suspected militants there. 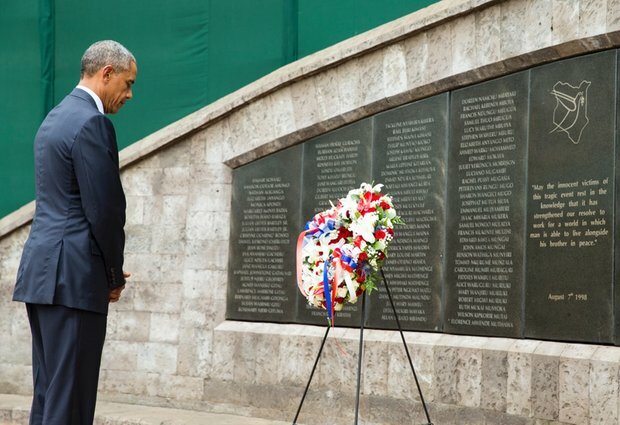 Obama's first full day in Africa came with a solemn reminder of the past. In between meetings in Nairobi, Obama placed a red-and-white wreath at the site of the 1998 bombing of the U.S. Embassy, bowing his head for a moment before studying the names of the victims etched into a brick wall. He was joined at the site by his national security adviser, Susan Rice, who was the top U.S. diplomat to Africa at the time of the bombing. Although the memorial isn't a crime scene, the yellow tape local authorities used to rope it off for Obama's visit suggested otherwise. "Crime Scene Do Not Cross" the tape warned in capital letters. Perhaps it was the only tape available. Extremists simultaneously attacked the U.S. embassies in Nairobi and Dar es Salaam, Tanzania, on Aug. 7, 1998. The Kenya attack killed more than 200 Kenyans and 12 Americans at the embassy. Thousands were injured, including Julie Ogoye, a Kenyan government worker, who suffered grievous injuries and has long questioned whether the United States will provide financial compensation. "I just want to know what his view is on the issue," Ogoye said of Obama. With his record on Africa being challenged, Obama pushed back on the notion that America's first black president hasn't done as much as his predecessors to help Africa's development. In the run-up to his trip, Obama faced comparisons to President George W. Bush, whose PEPFAR program steered huge sums of money into efforts to fight the AIDS epidemic in Africa. Rather than downplay Bush's accomplishments, Obama said he was proud of the work previous administrations did. He added that PEPFAR had saved millions of lives. "This isn't a beauty contest between presidents," he told reporters. On multiple occasions, Obama sought to defend his "Power Africa" initiative, which aims to double sub-Saharan access to electricity but has been criticized for failing to deliver any actual megawatt gains since Obama announced it in 2013. Building power plants takes time, Obama said, even in the United States. He promised that ultimately, millions more people will have reliable electrical power, boosting economic productivity in the process. In an attempt to showcase Power Africa, Obama toured five exhibits from Power Africa partners on display at the business summit, including solar panels. Obama said Africa has a chance to "leapfrog" over dirty energy — meaning fossil fuels like coal and oil that must be burned — to cleaner sources like solar. One presenter told Obama that his invention repurposed biofuel and showed off a set-up included a device resembling a pot with a hose snaking out from the top. "Either that or you're making moonshine," Obama told him.